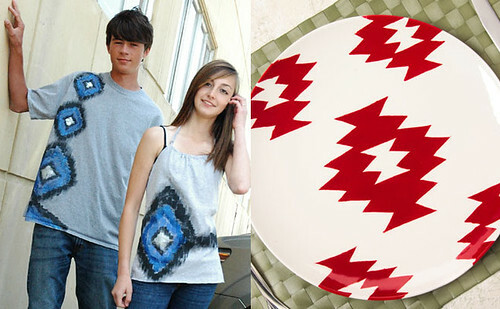 iLoveToCreate Blog: Get the look: IKAT! Did you know that our site, www.ilovetocreate.com has lots of cool trend resources for our crafters and fashion designers? Jen, our top-notch trendspotter researches hot trends as well at upcoming ones and brings awesome reports that are posted on our media page. 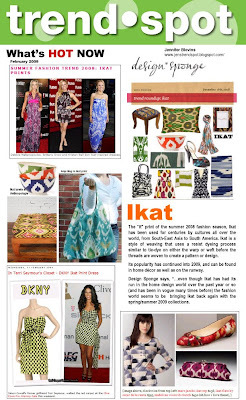 The report above (click on the pic to enlarge it for reading) is all about one of summer's hottest trends, IKAT! We look at these trends and create projects like the ones below for our site! These are our t-shirt and plate of the month projects and in a couple of days, we will have another set of projects of the month based on another trend! It's all about keeping up with what we are seeing in fashion...from the street, to the runways, to what's online! We keep tabs on it and will bring it to you! We hope you like it!